Congratulations to Newport News Public Schools on the launch of a very attractive NNPS-TV channel in Apple TV! NNPS-TV’s Apple TV channel was developed by TelVue and is powered by the same versatile CloudCast content management system that streams NNPS-TV videos to the NNPS website and the NNPS Roku channel. 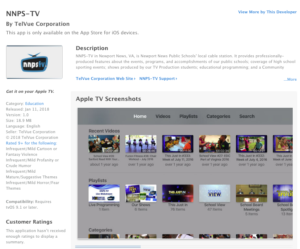 The NNPS Apple TV channel displays a 24/7 live feed as well as video on demand, organized by playlists and categories. The homepage display is made all the more attractive with NNPS’s use of eye-catching branding graphics for all of its programs.